You can't swing a baguette in this town without hitting some fantastically weird street art; graffiti, stencils, wheat paste posters, guerilla sculptures, etc. 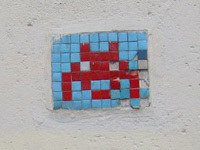 A lot of these pics were things I serendipitously found while out hunting for Space Invader pixel tile mosaics. Something I love about all of these pieces of public art is that they're all variously temporary in nature, and in many cases are probably no longer there. Anyway, I'll add more as I find 'em! 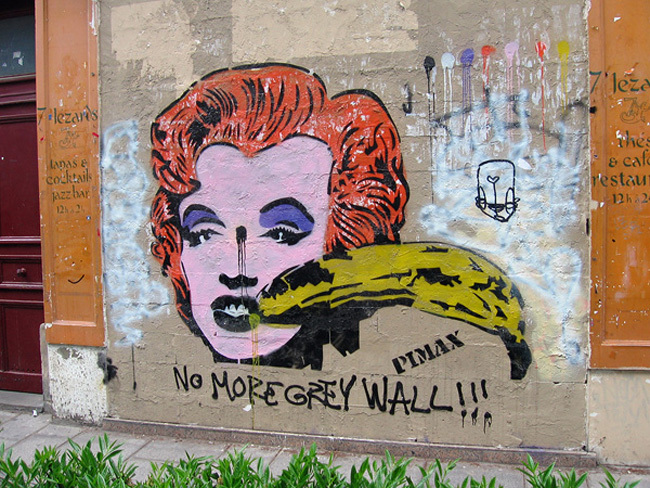 An unfortunate Andy Warhol mashup starring Marilyn Monroe and that Velvet Underground album. 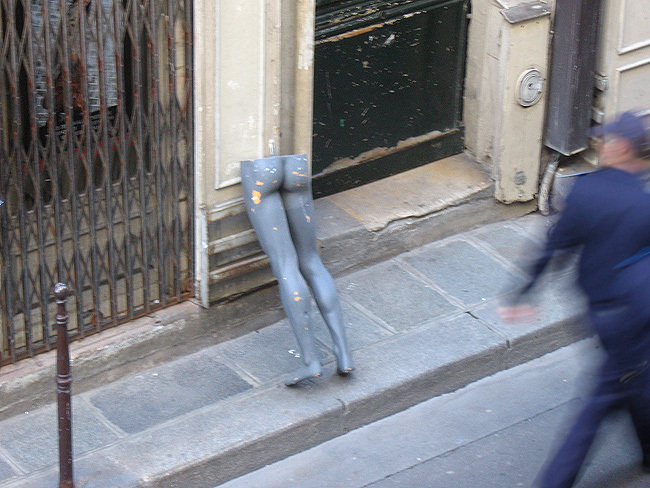 Found on the Rue des Rosiers. At first I thought it said "No more Warhol." 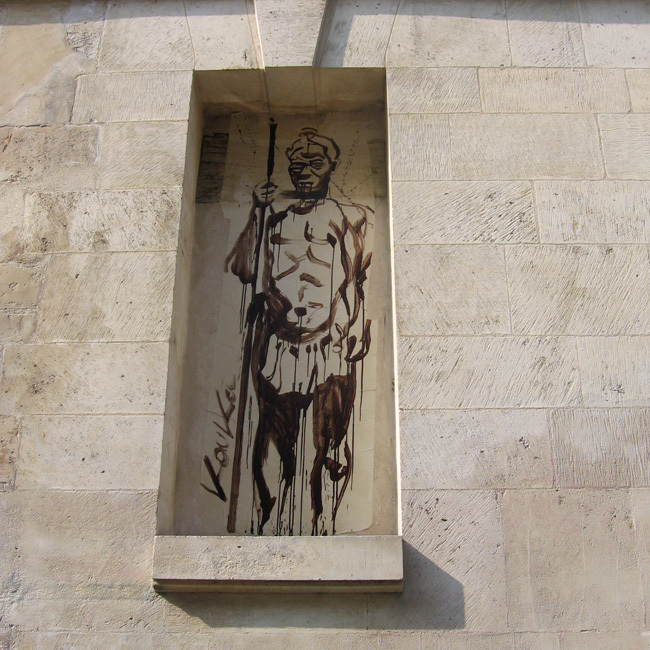 I love the loose paintbrush style on this gentleman, found on a small side street off of the Rue de Temple. Weeks later I saw a row of similar guys by the same artist, in Belleville, but sadly I didn't have my camera on me that day. 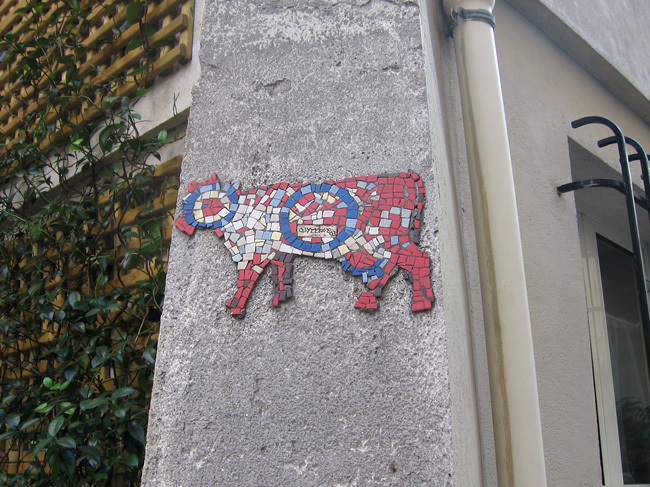 Cow mosaic on the Rue Marie Stuart, just off Rue Montorgueil. 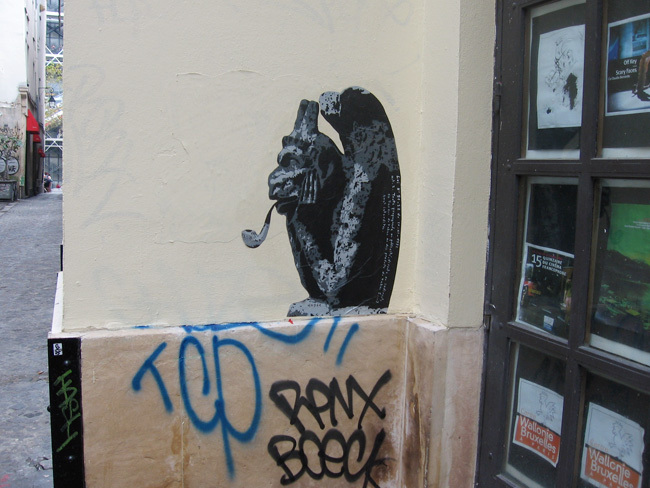 This pipe-smoking gargoyle was at the corner of a tiny street called the Rue de Venise, and you can just barely see the Centre Pompidou in the background to the left. Haha, I love this! 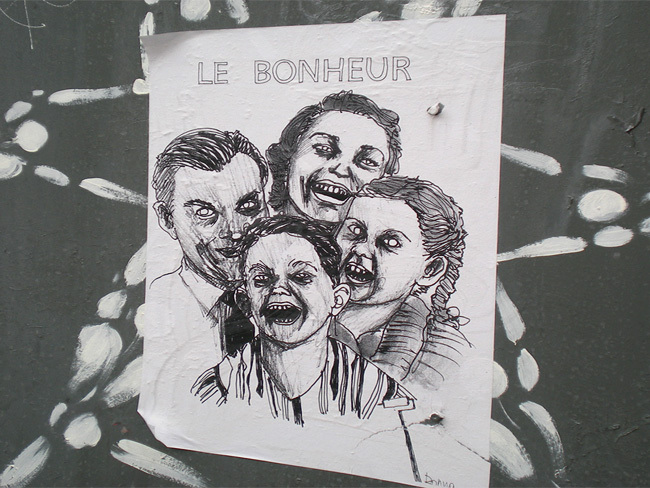 "Le bonheur" = happiness. 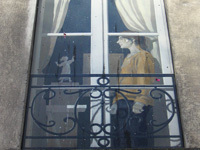 Found on the Rue des Hospitalières Saint-Gervais, in the Marais. "I've always dreamed of being a rock band." No fuzzy monsters allowed. 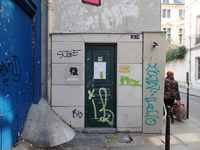 Found on Rue Française, right by Rue Etienne Marcel. 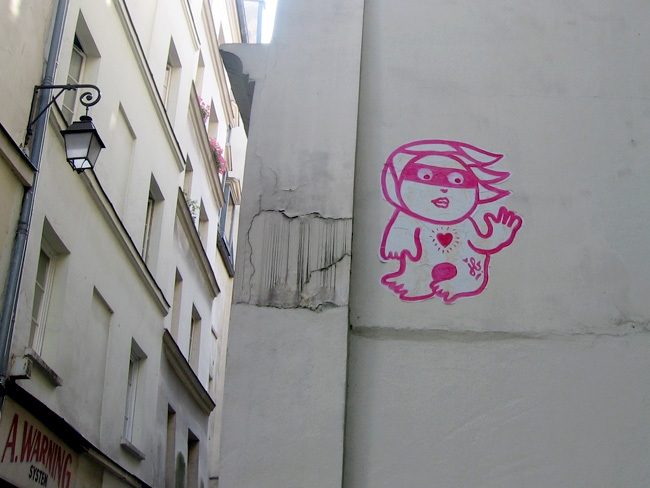 Cute pink person on a side street near the Place de la République. 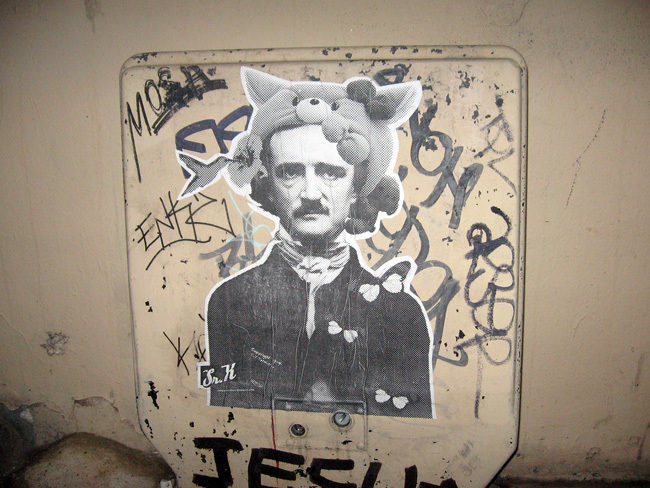 Edgar Allen Poe and his fabulous hat were right outside my door in the 3rd arrondissement. 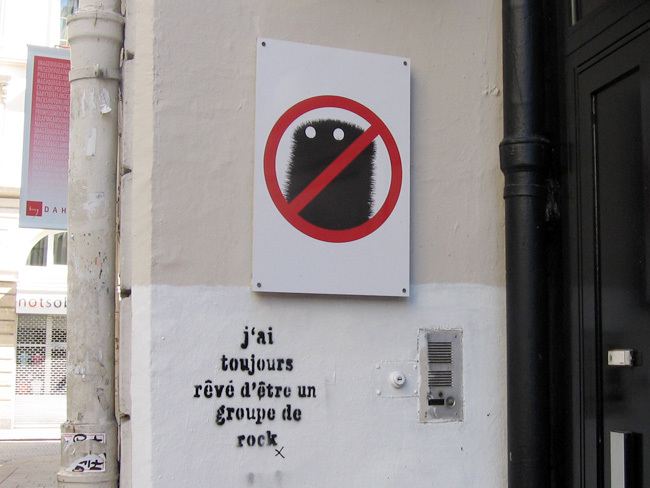 No idea what or who Walala is, but this poster was briefly on a wall on the Rue Greneta. Okay, okay, this one doesn't count as street art or public art at all, really, but this half-of-a-mannequin was the view from my living room window the other night, and it made me laugh. I wanted to bring it inside but my girlfriend wouldn't let me. Fifteen minutes later it was gone! Feel free to send me any pics of weird art or other strange sights you bump into and I'll post 'em! Or better yet, start your own blog! Why do I gotta do everything? Next: On to part two!